Yes today sees me personally, not the blog for I don’t believe blogging has been possible for such a length of time, celebrating my 29th Birthday. That said, celebrations will be on hold at Savidge Towers for quite some time, as I shall be spending most of the first day of my 29th year unconscious thanks to the joys of general anaesthetic. In fact when you are reading this, unless it’s very early when I will be in bed opening some presents (only one book shaped so far), I will either be fully under the influence of the anaesthetist or recovering from it all and feeling a little groggy. 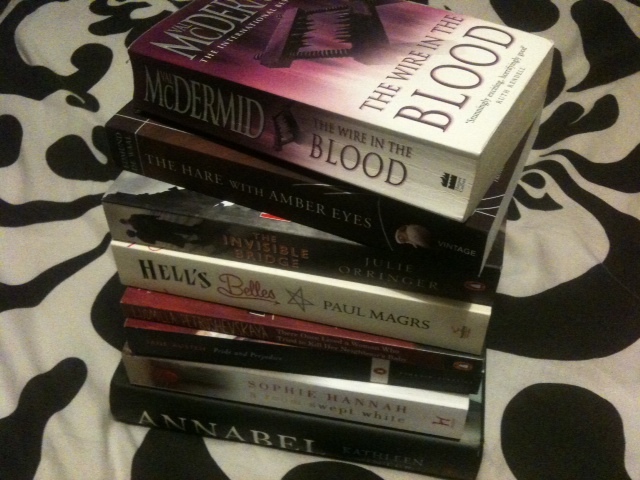 I probably don’t need this many books but c’est la vie. I have some crime, which I always seem to be in the mood for at the mo, with the next in the series of both Sophie Hannah and Val McDermid. I have popped some of The Orange Longlist in, the rather huge debut from Julie Orringer which I am slightly nervous of plus ‘Annabel’ which is one of the titles I am most excited about and therefore guess I wont actually read. We have some supernatural sensation mixed with balmy old biddies in the fourth Brenda and Effie novel ‘Hell’s Belles’. Some dark adult fairytales in the wonderfully entitled collection ‘There Once Was A Woman Who Tried To Kill Her Neighbours Baby’. Non fiction, which I am getting more and more into in the form of ‘The Hare With Amber Eyes’, a book nearly everyone is talking about and I want to find out why. Oh, plus a classic and ‘book I should really have read by the time I hit 30’ which is ‘Pride and Prejudice’ more on this latter type of book in due course. Posts are scheduled to go up while I am away but forgive me if I don’t comment back, if they stop due to glitches or if you don’t see me commenting on your blogs if you have one. I will report back when I can and let you know how I get on. Right I best be off, I bet they don’t do birthday cake at the hospital do they?? Happy Birthday and I hope they do birthday cake in hospital! Hope the surgery is a success, the anaesthesia has mild after-effects and that you get plenty of that reading done! I hope the procedure goes well. I’m thinking about you and sending warm thoughts to you. Take care have a Happy Birthday and a Speedy Recovery. Happy Birthday! Better this than spending a birthday not well? At least you can go celebrate ten fold once you’re out and about! Ooh – maybe you’ll get hospital icecream and jelly for dinner! So happy birthday, and be well! Happy birthday and wishing you a speedy recovery! At least you have lots of books to read! Happy Birthday Simon, and i wish you a speedy recovery. Lots of good wishes. Praying for complete healing for you. Enjoy your recovery! Happy Birthday, Simon!! Hope everything goes well with the surgery. Wishing you a speedy recovery!! Happy Birthday Simon. I’m sorry it won’t be much of a birthday…but just think, this time next year…all that you’ve been through this year will *hopefully* be a distant memory, and you’ll have even more reason to celebrate. Sending you lots of warm well wishes and I hope everything goes to plan today. Rest up, take care of yourself, and get plenty of lovely reading done. I’m thinking of you! Happy Birthday Simon! Best wishes for the surgery and for an uneventful recovery with lots of time to rest and focus on reading! Happy birthday and hope that everything goes well today. You’re in all our thoughts. Hope you enjoyed your serenade this morning. Will be thinking about you today. Happy Birthday, Simon! I hope your procedure goes well. I’m sending good thoughts and lots of prayers. Seriously, I hope all goes well and that you aren’t in too much pain. Take care of yourself, and be well. Happy Birthday, Simon. Warmest wishes for a speedy recovery from the surgery, and lots of lovely reading time as you recuperate. To make up for the real one being overshadowed, I think you should follow the Queen’s example and declare an official birthday in the middle of the summer. Happy Birthday and get well soon. Happy Birthday. Hope all goes well. I would go with the David’s idea and have another birthday. If it works for the Queen then why not you! Think of all them books you could receive. Happy Birthday To You ♪♫•*¨*•.¸¸♥ •*¨*•♫♪ ♥ Happy Birthday To You ♪♫•*¨*•.¸¸♥ ¸¸.•*¨*•♫♪Happy Birthday dear Simon ♪♫•*¨*•.¸¸♥ ¸¸.•*¨*•♫♪ Happy Birthday To You! Happy 29th. Wishing you a year of reading, healing, and happiness. Happy Birthday Simon and here’s hoping that everything goes smoothly. Very best wishes for a speedy recovery, Simon. Happy Birthday, and very best wishes for a speedy recovery, Simon! Onwards and upwards, with this new chapter in your life. Happy Birthday Simon. What a way to be spending it. I hope that the operation turns into a gift of healing for you. Happy Birthday Simon, hope that you felt up to celebrating after the anaesthetic had worn off! Late birthday wishes, but still good ones. I cross my mental fingers that all went as well as could be hoped. Have an ‘official’ birthday a bit later in the year instead! Very best wishes for your recovery. Happy birthday, and I hope all goes well. Happy birthday, Simon. Hope all went well and that you have been able to celebrate since. Thank you all SO SO SO SO much for all your thoughts and the like its meant a huge amount to me and sorry I have been so slack at replying to all your comments. I am trying to catch up with them all!